The agreement calls on Syria to destroy all of its chemical weapons and requires Damascus to submit a full inventory of its stocks within the next week. 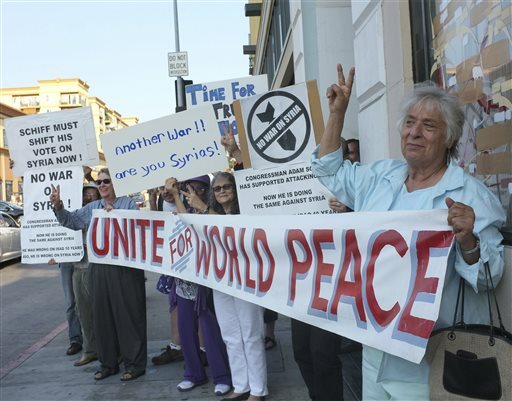 GENEVA — A diplomatic breakthrough Saturday on securing and destroying Syria’s chemical weapons stockpile averted the threat of U.S. military action for the moment and could swing momentum toward ending a horrific civil war. Marathon negotiations between U.S. and Russian diplomats at a Geneva hotel produced a sweeping agreement that will require one of the most ambitious arms-control efforts in history. The deal involves making an inventory and seizing all components of Syria’s chemical weapons program and imposing penalties if President Bashar Assad’s government fails to comply will the terms. 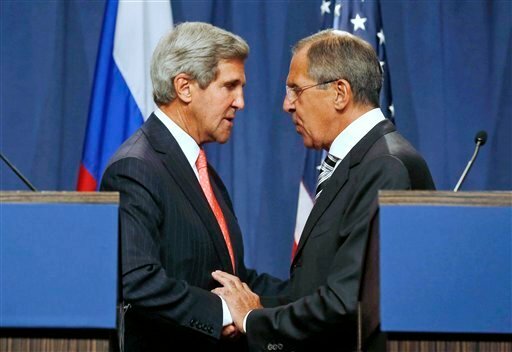 After days of intense day-and-night negotiations between U.S. Secretary of State John Kerry and Russian Foreign Minister Sergey Lavrov and their teams, the two powers announced they had a framework for ridding the world of Syria’s chemicals weapons. The U.S. says Assad used them in an Aug. 21 attack on the outskirts of Damascus, the capital, killing more than 1,400 civilians. That prompted President Barack Obama to ready American airstrikes on his order — until he decided last weekend to ask for authorization from the U.S. Congress. Then came the Russian proposal, and Obama asked Congress, already largely opposed to military intervention, to delay a vote. Kerry and Lavrov said they agreed on the size of the chemical weapons inventory, and on a speedy timetable and measures for Assad to do away with the toxic agents. The deal offers the potential for reviving international peace talks to end a civil war that has claimed more than 100,000 lives and sent 2 million refugees fleeing for safety, and now threatens the stability of the entire Mideast. Kerry and Lavrov, along with the U.N.-Arab League envoy to Syria, Lakhdar Brahimi, said the chances for a follow-up peace conference in Geneva to the one held in June 2012 would depend largely on the weapons deal. International inspectors are to be on the ground in Syria by November. During that month, they are to complete their initial assessment and all mixing and filling equipment for chemical weapons is to be destroyed. They must be given “immediate and unfettered” access to inspect all sites. 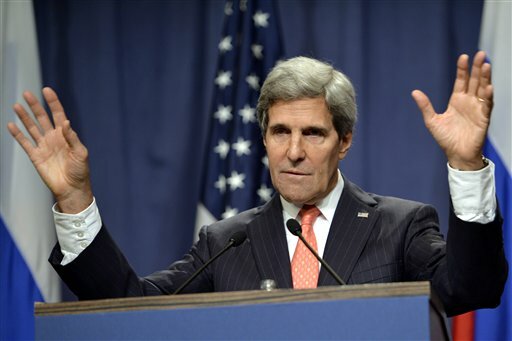 All components of the chemical weapons program are to be removed from the country or destroyed by mid-2014. For the moment, the deal may not do much to change the fighting on the ground. But the impasse in the international community over how to react could ease somewhat with the U.S. and Russia also agreeing to immediately press for a U.N. Security Council resolution that enshrines the weapons deal. They will seek a resolution under Chapter 7 of the U.N. Charter, which can authorize both the use of force and nonmilitary measures. But Russia, which already has rejected three resolutions on Syria, would be sure to veto a U.N. move toward military action, and U.S. officials said they did not contemplate seeking such an authorization. Noncompliance by the Assad government or any other party would be referred to the 15-nation Security Council by the Organization for the Prohibition of Chemical Weapons. That group oversees the Chemical Weapons Convention, which Syria this past week agreed to join. The U.N. received Syria’s formal notification Saturday and it would be effect Oct. 14. U.N. inspectors were preparing to submit their own report. Secretary-General Ban Ki-moon said Friday that he expected “an overwhelming report” that chemical weapons were indeed used on the outskirts of Damascus on Aug. 21. Britain’s foreign secretary, William Hague, said Saturday’s development was “a significant step forward.” Germany believes that “if deeds now follow the words, the chances of a political solution will rise significantly,” Foreign Minister Guido Westerwelle said.